Marinated chicken breast in a spiced cream, tomato and butter sauce with spiced basmati rice. A taste of India. Creamy tomato and butter curry made with a traditional spice blend. Working in partnership with expert Indian chefs we use traditional layering methods to create depth of flavour. 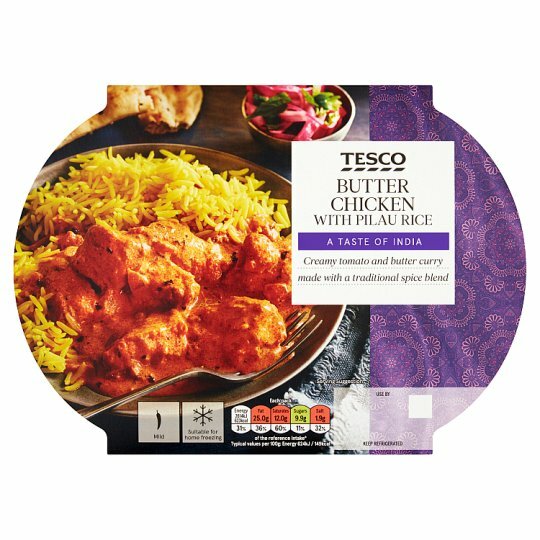 INGREDIENTS: Cooked Pilau Rice [Water, Basmati Rice, Rapeseed Oil, Salt, Concentrated Lemon Juice, Cumin Seeds, Colour (Curcumin), Cardamom Pods, Cardamom Powder, Bay Leaf Powder], Chicken Breast (22%), Single Cream (Milk), Onion, Tomato, Tomato Purée, Tomato Juice, Ginger Purée, Garlic Purée, Honey, Butter (Milk), Cornflour, Yogurt (Milk), Coriander Powder, Paprika, Salt, Cumin Powder, Soya Oil, Palm Oil, Green Chilli, Fenugreek Leaf, Turmeric Powder, Colour (Paprika Extract), Black Pepper, Chilli Powder, Cinnamon Powder, Clove Powder, Cardamom Powder, Fennel, Bay Leaf Powder, Ginger Powder, Mace, Star Anise, Fenugreek, Basil Powder, Sunflower Oil. Instructions: 190°C/Fan 170°C/Gas 5 25 mins Snap the compartments in half, place the Butter Chicken on a baking tray in the centre of a pre-heated oven for 10 minutes. Peel back film lid, stir, re-cover, then add the rice compartment onto the baking tray and heat both for a further 15 minutes. Leave to stand for 2 minutes after heating. Stir well before serving. 800W / 900W 5 mins 30 secs / 5 mins. Snap the compartments in half, place the Butter Chicken in the microwave and heat on full power for 2 minutes 30 seconds (800W)/(900W). Then place the rice compartment in the microwave and heat both on full power for a further 3 minutes (800W)/ 2 minutes 30 seconds (900W). Leave to stand for 2 minutes after heating. Stir well before serving.